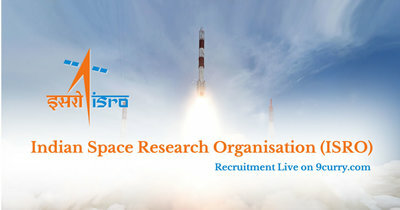 ISRO Recruitment 2019 - Below are various recruitment notifications published by Indian Space Research Organisation (ISRO) / www.isro.gov.in. As of now, we don't have any active recruitment notification by ISRO featured here. We may update as soon as the organization announces a new job notification. If you are looking for any information related to previously organized recruitment drives by ISRO, you can browse through previous job notifications mentioned below and get the new updates or information you are looking for. SAC Recruitment 2019 - Apply Online for Graduate & Technician Apprentices Posts in SAC, Ahmedabad, Gujarat. Online Applications are invited by Space Applications Centre from 01 Mar 2019 to 15 Mar 2019. ISRO Recruitment 2019 - Apply Online for Library Assistant Posts in ISRO, Bengaluru, Karnataka. Online Applications are invited by Indian Space Research Organisation (ISRO) from 12 Mar 2019 to 01 Apr 2019 for 2 vacancies. IIRS Recruitment 2019 - Apply Online for Scientist / Engineer - SD Posts in Department of Space, IIRS, Dehradun, Uttarakhand on Temporary Basis. Online Applications are invited by Indian Institute of Remote Sensing, Dehradun, ISRO from 21 Jan 2019 10:00 AM to 09 Feb 2019 11:59 PM for 2 vacancies. ISRO Recruitment 2018 - Apply Online for 18 Scientist/ Engineer SC Posts in ISRO, Karnataka, Punjab on a Temporary Basis. Online Applications are invited by Indian Space Research Organisation (ISRO) from 26 Dec 2018 to 15 Jan 2019 for 18 vacancies. VSSC Recruitment 2018 - Apply Online for 14 Technical Assistant, Scientific Asst & Library Asst-A Posts in VSSC, Kerala. Online Applications are invited by Vikram Sarabhai Space Centre from 24 Dec 2018 at 10:00 AM to 09 Jan 2019 till 05:00 PM for 14 vacancies. VSSC Recruitment 2018 - Apply Online for 8 Fitter & Electronic Mechanic Posts in Department of Space, VSSC, Andhra Pradesh. Online Applications are invited by Vikram Sarabhai Space Centre from 24 Dec 2018 10:00 AM to 13 Jan 2019 05:00 PM for 8 vacancies. VSSC Recruitment 2018 - Apply Online for 64 Technician-B, Draughtsman-B, Cook, Catering Attendant, Firaman-A Posts in Department of Space, VSSC, Thiruvananthapuram, Kerala. Online Applications are invited by Vikram Sarabhai Space Centre from 24 Dec 2018 10:00 AM to 11 Jan 2019 05:00 PM for 64 vacancies. VSSC Recruitment 2018 - Walk in for 173 Graduate Apprentice Posts in VSSC, Kerala. Candidates are invited by Vikram Sarabhai Space Centre to attend walk-in-interview to be held on 01 Dec 2018 for 173 vacancies. IIRS Recruitment 2018 - Walk in for 15 JRF & RA Posts in Department of Space, IIRS, Dehradun, Uttarakhand. Candidates are invited by Indian Institute of Remote Sensing, Dehradun, ISRO to attend walk-in-interview to be held on 27 Oct 201825th, 26th, & 27th Oct 2018 09:00 AM for 15 vacancies. ISRO Recruitment 2018 - Apply Online for Technician B (Electrical) Post in Department of Space, ISRO, Bengaluru, Karnataka. Online Applications are invited by Indian Space Research Organisation (ISRO) from 06 Oct 2018 to 26 Oct 2018 for 1 vacancy.